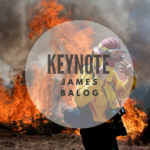 Our keynote presentations are among the most inspiring events at Summit, bringing the world’s top nature photographers to you in engaging, highly personal presentations about their storied careers, including what kept them motivated when times were tough. The National Geographic Photo Ark is a multiyear effort to raise awareness of and find solutions to disappearing wildlife and their habitats. Led by National Geographic photographer Joel Sartore, the project aims to document every species living in the world’s zoos and wildlife sanctuaries, inspire action through education, and help save wildlife by supporting on-the-ground conservation efforts. Sartore started the Photo Ark in his hometown of Lincoln, Nebraska, over a decade ago. Since then he has visited 40 countries and has completed portraits of more than 8,000 of the estimated 12,000 species of birds, fish, mammals, reptiles, amphibians, and invertebrates. Once completed, the Photo Ark archive will serve as an important record of each animal’s existence and a powerful testament to the importance of saving them. The project engages students in the classroom through free educational materials and activities, and inspires the public through special exhibitions, books, TV specials, features in National Geographic magazine, and events around the world. An interactive digital experience allows people to engage with Photo Ark content on our website, explore animals in the collection, and share information about endangered species with their social networks. 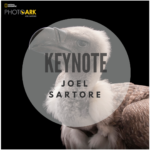 Joel Sartore is a photographer, speaker, author, teacher, conservationist, National Geographic Fellow, and regular contributor to National Geographic magazine. His hallmarks are a sense of humor and strong work ethic. Sartore started the National Geographic Photo Ark some 11 years ago in his hometown of Lincoln, Nebraska. Since then he’s visited 40 countries in his biodiversity with the goal of helping to preserve species. Sartore has produced several books including RARE: Portraits of America’s Endangered Species, Photographing Your Family, and two new National Geographic Photo Ark books: The Photo Ark and Animal Ark. National Geographic Photo Ark fans are also invited to join the conversation on social media with #SaveTogether and learn more about how to get involved with the project at NatGeoPhotoArk.org. In addition to the work he has done for National Geographic, Sartore has contributed to Audubon magazine,Life, The New York Times, Sports Illustrated and numerous book projects. Sartore and his work have been the subjects of several national broadcasts, including National Geographic’s Explorer, NBC Nightly News, NPR’s Weekend Edition, Fresh Air with Terry Gross and the PBS documentary series Rare: Portraits of the Photo Ark. He is also a regular contributor on the CBS Sunday Morning Show. Want a sneak peek? Watch the “60 Minutes” feature on Joel and the National Geographic Photo Ark. Join wildlife filmmaker and photographer Sue Flood on her adventures from A(ntarctica) to Z(ambia). Get behind-the-scenes details of her experiences in the field, particularly the polar regions, and how these experiences in extreme environments led to the publication of her books Cold Places and Emperor: The Perfect Penguin. 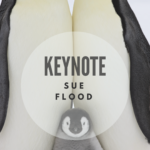 Sue Flood is an award-winning former BBC Natural History Unit documentary maker, public speaker, member of the Explorers Club and a Fellow of the Royal Geographical Society. Sue worked on award-winning series The Blue Planet and Planet Earth, before becoming a professional wildlife and travel photographer. Her work takes her all over the world but she has a special passion for the wildlife and icy beauty of Antarctica and is one of the very few women who chooses to return again and again to Earth’s harshest and most demanding environment. When she’s not in some far-flung location, Sue lives with her husband Chris in North Wales. We humans are a force of nature. At the same time human activities alter the basic elements of life—earth, air, water, and fire—and those elements change human life in turn. For almost 40 years, photographer James Balog (“BAY-log”) has broken new conceptual and artistic ground on one of the most important issues of our era: human modification of nature. An avid mountaineer with a graduate degree in geography and geomorphology, James is equally at home on a Himalayan peak or a whitewater river, the African savannah or polar icecaps. His new film, The Human Element, is an innovative and visually stunning look at how humanity interacts with earth, air, fire and water. Its world premiere was at the San Francisco Film Festival in April. To reveal the impact of climate change, James founded the Extreme Ice Survey (EIS) in 2007. It is the most wide-ranging, ground-based, photographic study of glaciers ever conducted. The project was featured in the internationally acclaimed documentary Chasing Ice and in the 2009 PBS/NOVA special Extreme Ice. One YouTube video clip from Chasing Ice has received more than 40 million views. Chasing Ice won an Emmy in 2014 and was shortlisted for the Academy Awards. It has been screened at the White House, U.S. Congress, Great Britain’s House of Commons, the United Nations, and major international science and policy conferences, including COP-15 in Copenhagen and COP-21 in Paris. NBC, ABC, CBS, CNN, PBS, and NPR have done features on his work, as have David Letterman, Bill Maher, and Bill Moyers. James is the author of eight books. His images have been collected in dozens of public and private art collections—and extensively published in the world’s magazines, particularly National Geographic. An internationally recognized photographer, his images have been published in National Geographic, GEO, BBC Wildlife, and CNN recently featured his conservation work. He is the author of several books published by Braided River, including Yellowstone to Yukon – Freedom to Roam, To The Arctic, and The Wild Edge – Freedom to Roam the Pacific Coast. Schulz won numerous awards including “Environmental Photographer of the Year,” Sierra Club’s “Ansel Adams Award,” amongst others. He was awarded the 2006 Philip Hyde Environmental Grant by NANPA and received NANPA’s first Vision Award in 2008. 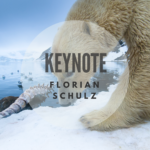 Today Schulz brings the wild side of our amazing planet closer to diverse audiences in Europe and North America, reaching thousands of people through his life talks. In a new era, where film and photography are merging, he has recently evolved as a producer in nature filmmaking, shooting in the highest standards of cinema quality. The result: outstanding film sequences, rarely witnessed before. Schulz is finalizing his first feature documentary about The Arctic Refuge. He lives with his wife Emil and boys Nanuk (6) and Silvan (3) between Anchorage, Alaska and La Paz in Baja (Mexico). To learn more go to www.florianschulz.org. What are the essential elements of a successful career in nature photography? NANPA Lifetime Achievement Award recipient George Lepp’s answer to this enduring question explores the grand circle of any professional artist’s life well lived: receiving and sharing the gifts of inspiration, support, evolution (technical and creative, intellectual and ethical), and, above all, the continuing ability to recognize the extraordinary while appreciating the everyday wonders of the natural world. In this program, George Lepp recalls the places, people, philosophies, products, and principles that have motivated and sustained his lifetime passion for nature photography. He shares the ways in which these important factors contributed to his successful fifty-year career, and how they can serve as inspiration and motivation for all nature photographers in today’s challenging and rapidly changing environments. 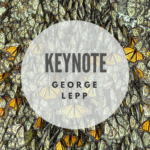 One of North America’s best-known contemporary outdoor and nature photographers and a leader in the field of digital imaging, George Lepp is the author of many books and hundreds of nationally and internationally published articles about the creative, ethical, and technical aspects of nature photography. He is field editor of Outdoor Photographer magazine, where his “Tech Tips” column is widely read. His photography is extensively published and exhibited, and represented by Getty Images, Corbis, AgStock, and Photo Researchers. Lepp is one of the first members of Canon USA’s Explorers of Light program, featuring the industry’s most influential photographers. He has presented hundreds of lectures and led workshops all over the world, and often serves as a judge of international photography competitions. Founder and Fellow of the North American Nature Photography Association (NANPA), Lepp has won many awards for his work, including Photo Media’s Photography Person of the Year and the Photographic Society of America’s prestigious Progress Award. First trained in wildlife and wildlands management, Lepp later earned a BA and honorary MSc from Brooks Institute of Photography. George and his wife and collaborator, Kathryn Vincent Lepp, live in Bend, Oregon, and can be contacted at www.GeorgeLepp.com.